Free Chicken @ KFC- May 6th!! 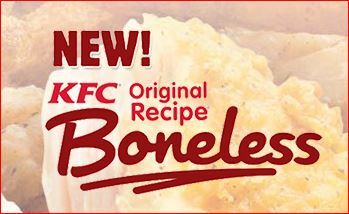 Be one of the first 100 guests to say “I ate the bones” or request a FREE piece of KFC Original Recipe Boneless from 2:00- 4:00 P.M. to get a FREE piece of the new KFC Original Recipe Boneless. Offer valid at at participating KFC restaurants in the United States. See more details HERE. I feel this is one of the myths of capitalism, that prtoifs flow to companies that produce better products. Hmm, sounds like a strawman myth espoused by opponents of capitalism, or those ignorant of it.Capitalism is simply what happens to capital when society and culture is organized around principles of freedom and private property. Capital flows to those who best utilize it to generate prtoifs period. Unfortunately, in societies organized around hierarchical and centralized oversight, regulation, and control, capital flows to those best able to game, manipulate, or otherwise influence or buy-off the system a pretty good description of America and the rest of the developed world where large corporations exist.To some extent, true capitalism does exist in America, but probably only in relatively unregulated industries (B2B, primarily) and amongst relatively small companies without the horsepower to get legislation passed to make things easier on themselves, tough on competition, and to set up barriers to new entries. Actually, our favorite is seotmhing called ?? or litterally green onion chicken. basically you get fried chicken with green onions. My boyfriend and some of my friends are obsessed with it, but not every place makes it quite the same way so it’s kind of hit or miss.